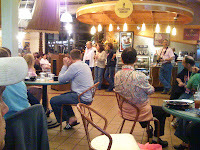 The evening before, we gathered at Hershey's Chocolate World for a dinner and announcements to kick off the week's event. 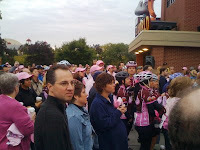 The attendance this year is up to 150 cyclist including 50 Hershey Foods employees. Along with the dedicated riders is returning breast cancer supporter Mari Holden of Giant Bicycles and Tour de France and all around arse kicker on the bike, Frank Andreu. My partner in crime and roommate for the week, Tim Fives, Cinco as we call him back home. We are doing the TdP for the third year. The cause is infectous as well as the supporters and riders we commune with for the 4 day trek to NYC from Hershey. My ride of choice for the week. 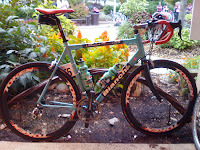 2008 Bianchi 928 T-Cube Chorus. I added the Token C50 hoops for a bit of assistance on the flats and climbs. 16lbs for a 63cm bike isn't too bad. I light bike can make a slow man feel fast...I need it! Me, Cinco and D hanging out with smiles before we start our 84 Mile journey to King of Prussia. Opening ceremonies. 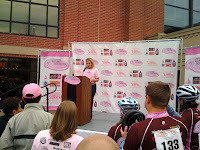 Hershey Foods was kind enough to donate $300,000.00 to this years Tour de Pink! Here is some of the crowd in attendance. Families, loved ones, friends and cyclists everywhere all for one cause, riding for a cure! The ride left around 0830 from Chocolate World and rolled along some of the nicest roads in south central Pennsylvania. I was blown away by the layout of the course, a ton of fun in the Lancaster, Manheim area. Lots of switchback roads, quick climbs, and fast descents to keep you on your toes. That and the plethora of golf ball sized nuts along the shoulder of the road to make sure you're paying attention. The first climb definitly slapped many of us hard. 14% grade at one point. I keep my pace and made a descision to bridge the field to join Matt Purdue and Eldon up ahead. Blowing through the first reststop, I caught up with the group lead by Mari Holden. The pace was heafty, especially because this is really my 6th day on the bike since the end of July. Slave to work I suppose. The lunch stop was welcomed with open mouths, Subway subs, cookies, muffins, drinks. They need to make jersey pockets larger so I can stuff all the viddles inside for the journey. I ate and rolled out with a smirk from Richie Rich from Giant Bicycles. I've seen that guy WAY too much this year; RAGBRAI, Interbike and now the Tour de Pink. The road unraveled and the pace liftted. At one point we made a turn and were welcomed with a viscious headwind at the '21miles to Malvern' sign. On the downside of the heated pace, we got ahead of the rest stop trucks before stops #3 and #4 could be set up. This yeild some popping or riders. 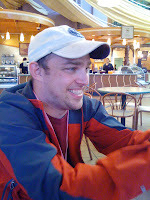 I commiserated with Matt Purdue and Eldon. That's alright. Those guys have such infectous personalities, it made the last 7 miles tolerable. Without water, gel or food, we drifted into the hotel and checked into our rooms. I can't remember the last time I enjoyed a restful shower/leg massage in my life. Tomorrow I'll actually remember to bring the digi-cam along on the ride. It was soooooo great to see you and Cinco off at the starting line this year. You guys rock. I posted the pix that I took. Sounds like you had a great first day. Keep up the good work and be safe.